From Watchmen's Comedian to Hellboy, Sin City's Marv to Wolverine, each one is cool. Lobo's wicked 'bastich face' design steals the spot as my favourite label, thanks to humourous copy like 'Czarnian Strong Ale' 'For Main Men'. 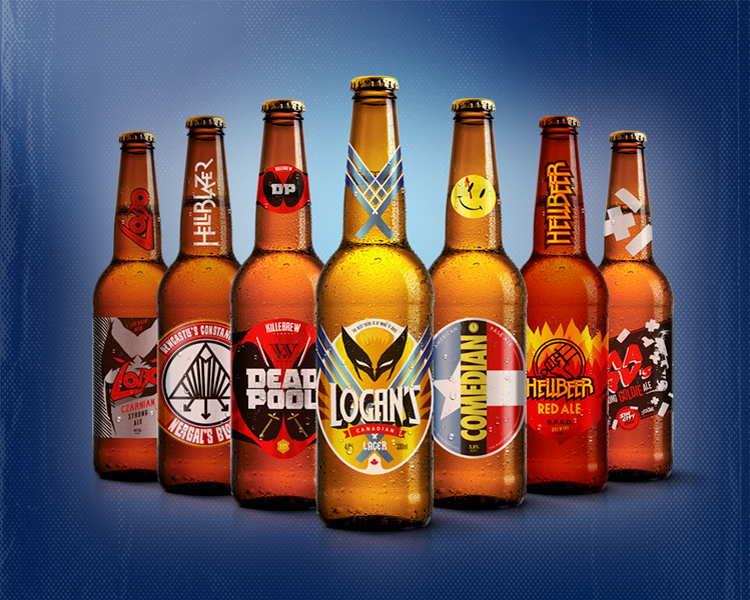 True, comic based beers aren't new to fan art, but the amazing design skills applied to the ones above, really makes them seem thirst-quenching-ly real. To see the full range close-up, visit Billy's website after the jump. ya know these remind me of this beer bottle on display at a local comic shop with a customized label of the iconic Iron Man Demon in a Bottle cover art. I would have bought it in a heart beat but it was there for display only. a damn shame mate.
. . . ok mate here's your assignment when you finally have the ol art bug crawl up your arse you should do some kind of "Kirby-ish" cosmic marvel 80s themed fan art. and as always if you can work ROM and/or the dire wraiths into the mix some where all the better. Sounds like a plan mr! As for the demon in a bottle thing, that's pretty clever. Looking back you realise just how ahead of the curve Marvel was with such 'real world' issues in their comics. I'm so there for trying those different beers man, especially the Hellblazer one. God only knows what the Comedian will taste like. Probably the equivalent to a nasty-tasting joke beer. Like those harry potter jelly beans. And we all know the Lobo one's pure rot-gut, as endorsed by the main man himself. On a slightly unrelated note, got your copy Dan. Just waiting to see how much it'll be to send it off. Naaw man, you're golden. No worries;) Gotta' rep Grindhorse. We're going international baby! I want the Hellbeer. I'm pretty sure it has spores in it. How cool is that?